The Mets had a confluence of events that finally led to a home win tonight. Jason Bay came off the disabled list, Terry Collins got thrown out, and David Wright started hitting again. Maybe the most important factor of the night was that Chris Capuano had a great start going 7 innings and only allowing 1 run. He lowered his ERA to 5.95 (still awful) but made some great progress tonight. Hopefully, he can get more consistent. 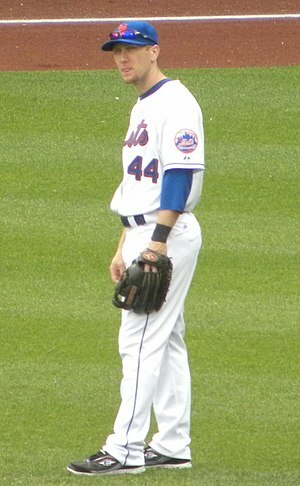 The Mets had some solid offense with 8 hits and 2 walks including three home runs. But they also took advantage of some bumbling, stumbling play by the sorry Astros. Mike Nickeas had his first career home run. David Wright got off an 0 for 20 schnide with a home run and Ike Davis hit his classic straight center field shot. The only down side to the game was that Angel Pagan left with an injury after running into Justin Turner on a pop up. It looked like he might have hyperextended his elbow but I’m sure we’ll hear more over the next day or so.